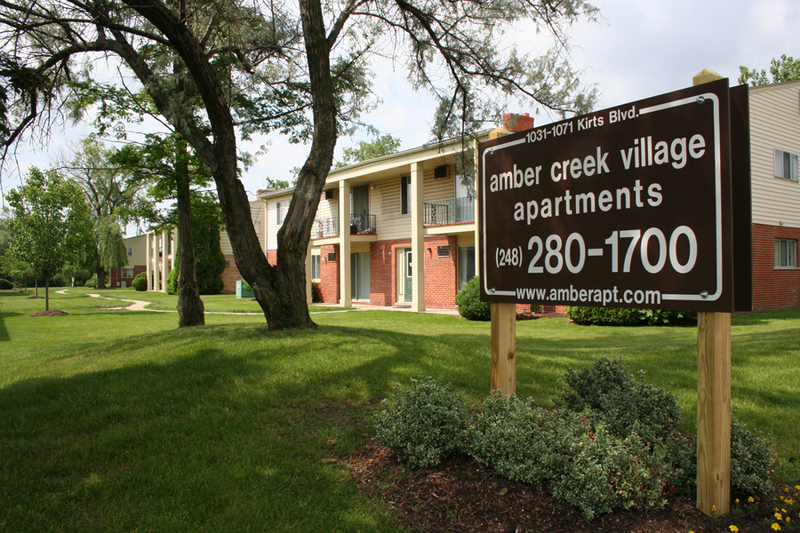 Amber Creek Village Apartments -- seven 2-story brick buildings and one private residence located on the south side of Kirts Blvd. (15½ Mile Rd. ), east of Crooks Rd. and west of Livernois Rd., Troy. Each of the four Seattle style 0 bedroom studio apartments (320-345 sf) is on the 1st or 2nd floor level. The Tacoma style 1 bedroom apartment (580 sf) is on the 1st floor level with private entry, 1½ baths, and individual laundry area with full-size washer and dryer. Each of the four Portland style 1 bedroom apartments (656 - 770 sf) is on the 1st or 2nd floor level with hallway or private entry, central A/C, and basement storage locker. Each of the sixteen 1 bedroom and three 1 bedroom with den Redmond style apartments (765 sf) is on the 1st or 2nd floor level. Each of the three Burlington style 2 bedroom apartments (765 sf) is on the 2nd floor level. Each of the two Yakima style 1 bedroom apartments (800 sf) is on the 2nd floor level. Each of the two Washington style 1 bedroom apartments + den/study (800 sf) is on the 1st floor level. The Winthrop style 2 bedroom apartment (1,000 sf) is on the 1st floor level. Each of the four Vancouver style 2 bedroom apartments (970 sf) is on the 1st or 2nd floor level with 1½ baths. Each of the four Spokane style 2 bedroom apartments (880 sf) is on the 1st or 2nd floor level. Each of the eight Olympia style 2 bedroom apartments (820 - 920 sf) is on the 1st or 2nd floor level. Each of the two Victoria style 2 bedroom townhouses (1,000 sf) is on two floors with 1½ baths, private front and rear entrances, partially-finished full basement, central A/C, carpeting (1st floor), oak floors (2nd floor), and individual laundry area with full-size washer and gas dryer. Ask about our gas bill / heat guarantee. The Calgary style 2 bedroom private residence (1,150 sf) includes central A/C, individual laundry room with full-size washer and gas dryer. Ask about our gas bill/heat guarantee. Most apartments include heat and hot water. 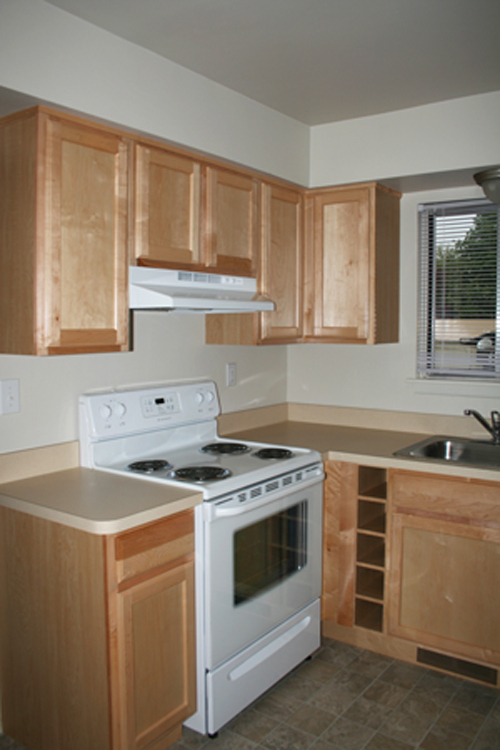 All apartments include cold water, kitchen appliances, dishwasher, vertical blinds, and off-street parking. 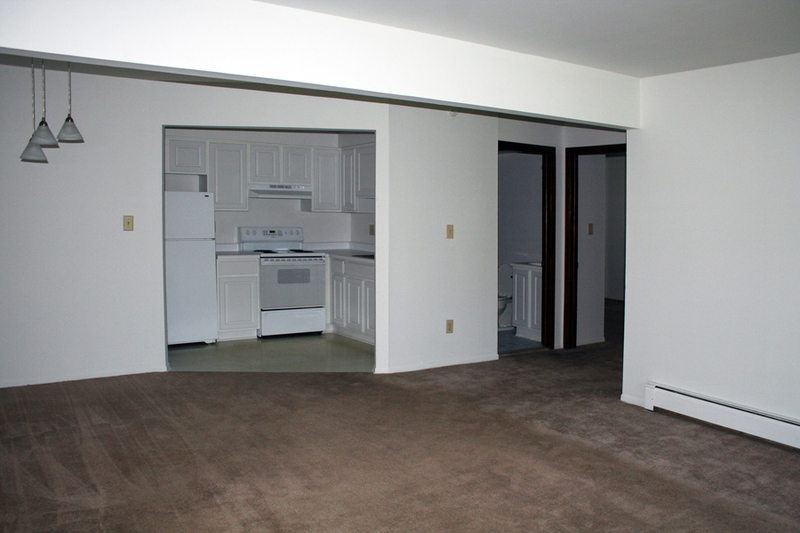 All apartments include carpeting, patio or balcony, ceramic-tiled bath, and air conditioner(s). 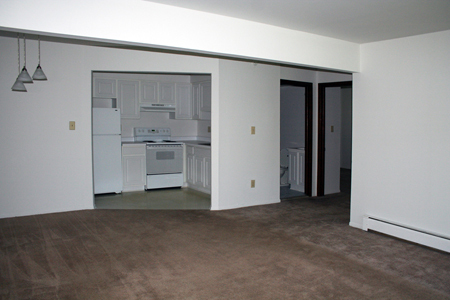 Most apartments have spacious living areas and large pantries. Cable T.V. available. Coin-operated laundry machines are located in each building. Amber Creek Village Apartments are near I-75, Troy Civic Center, Somerset Collection, hospitals and nearby offices; also close to Morse Elementary, Baker Middle, and Troy High Schools.